Rachel Wore A SILVER Gown—Not The Gold One That Leaked Online! Unlike our past representatives for Miss Universe, Rachel Peters was intent on keeping part of her preparations a secret. She chose to reveal the design of her gown only during the pageant itself, and everyone on her team had agreed to it. 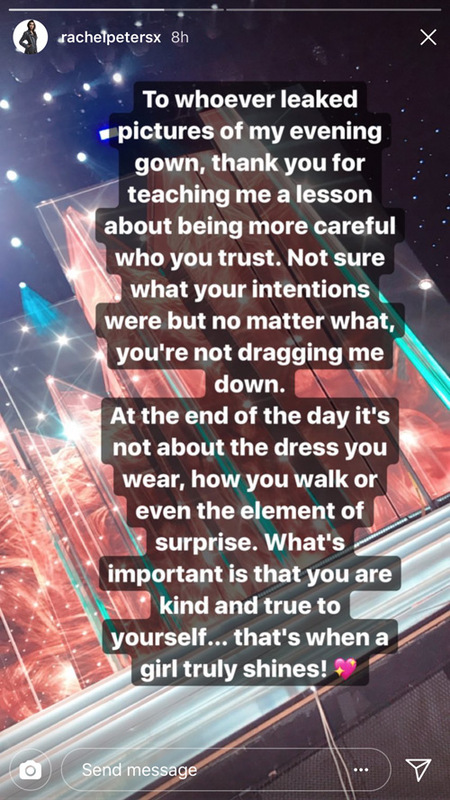 That's why it was such a shock when an unnamed Instagram account posted a photo of what looked like the bottom half of a sequined gown, claiming it was Peters' pick for her big night. Social media was on fire when Rachel’s sparkly gold mermaid gown by Val Taguba got leaked. Both Rachel and Val voiced their dismay over the incident, and Twitter was set on a new mission to bury the leak by posting other gowns to confuse the competition. Where we expected to see that familiar serpentina, a sparkly silver number with a thigh-high slit, midriff-baring side panels, and a plunging V neckline emerged instead.